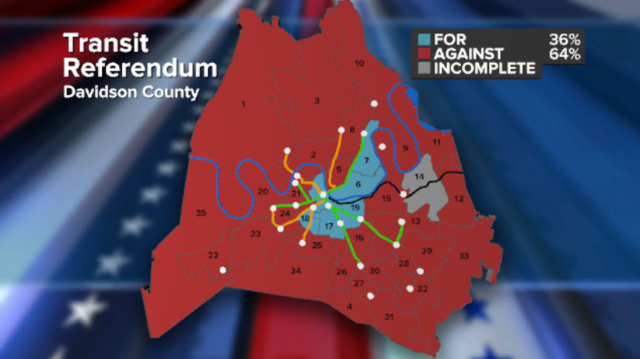 Davidson County residents voted down the "Let's Move Nashville" plan in the transit referendum. So what's next? The $5.4 billion plan would have included five light rail lines, an overhaul of the bus system, 19 neighborhood transit centers, sidewalks, bikes lanes and synchronized lights. However, it would have implemented four different tax increases in sales tax, business tax, rental car tax, and hotel tax. Opponents of the plan said the plan was not worth the tax increase, nor was it up to date with the most relevant transit solutions. This is a disappointing night for the thousands of Nashvillians who stood up over the last five years and said they wanted a transit system that allows everyone to get around our city cheaply, safely and more reliably. Our coalition was formed by many groups throughout the city that saw this transit plan as key to our city’s future prosperity and inclusiveness. Unfortunately, there were many other Nashvillians who did not. We certainly hope that everyone who voted against this plan because they wanted to see a better one will continue to make their voices heard moving forward. The problems of our traffic and growing inequality will not go away. It will be up to all of us to once again come to the table and do the hard work of developing a plan that addresses them. Since the plan failed, the city will go back to the drawing board to create a different plant residents can support, which will happen no sooner than 2020. Supporters believe the vote was Davidson County residents' way of saying they wanted to see a different plan. Officials say it will likely take another six to eight years to devise another mass transit plan that will likely cost taxpayers more than the original plan. "I just keep coming back to the point, today’s traffic is the same as tomorrow’s, it’s worse; so we have to continue to focus on solutions," said a plan supporter. The new mayor will have a hand in helping shape the plan. This is a disappointing setback for better transit options in Nashville. There will never be the perfect silver bullet to improving transportation options, but this plan was the most comprehensive and well-rounded that Nashville could offer. I hope that in the months and years to come, opponents and supporters can coalesce around a revised plan that will keep moving Nashville forward. Nashville has spoken. It is truly a great day for all Nashvillians. A majority of the 99% realized this plan would have been disastrous for our city, and they stopped it. BTN is very encouraged that a majority of Nashvillians had the common sense to stop this tragic transit tax plan. Our group of Democrats, Republicans, Occupiers, Independents, non-political citizens & many more, young & old, female & male, black & white, did what we could to inform voters. Now, we need to continue to hold our leaders accountable, in hopes that they will implement effective transit & traffic solutions, and more, that benefit all of us. God bless. The group called No Tax 4 Tracks led the charge against the transit plan. It was originally formed by auto mogul Lea Beaman. Other grassroots and volunteer groups like Better Transit for Nashville and Nashville Plan B formed, and some on the council were notably against it - including council member at-large and mayoral candidate Erica Gilmore, who recently changed her position after advocating for the plan. Council member Robert Swope offered his own alternative to the plan.